The ABCD Diaries: Girlie Glue: All-Natural Hair Accessory Glue! Girlie Glue is an all natural accessory glue — no hair necessary! The possibilities are endless with a dab of Girlie Glue. This glue is made with agave nectar and other all natural ingredients. A dab of Girlie Glue will hold hair accessories in place, in most cases, all day long. What's better? It's safe, 100% honey-free and washes away easily with water. You can use it to stick accessories to the skin and hair. 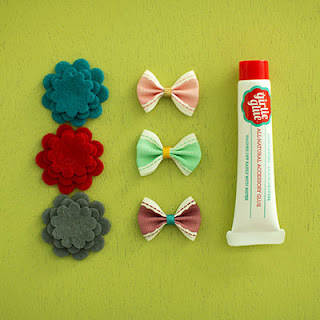 Girlie Glue will hold bows on babies and earrings on ears, then wash off easily. No clips, bands or even hair necessary. Girlie Glue bows and flowers are lightweight and simple, your baby won't even notice it is there. Accessorizing babies and toddlers with bows has never been easier or more comfortable. I was pretty impressed by this revolutionary product and I wish it had been around when my little princess was a baldy. Thankfully, moms of bareheaded baby girly girls now have a solution!